1. In late August Golden Dragon Productions announced on the Hyperscale 'Plane Talking' Forum that they are working on a full 1:48 kit of the CH-54 Skycrane, for release 'most likely in March or April 2005'. Meantime, Golden Dragon are taking pre-orders for a 1:32 Longbow conversion set designed for the Revell / Monogram AH-64A Apache, with a production date still listed as Sep-04. The set will contain a full cockpit, radome, and 'all exterior modifications'. 2. 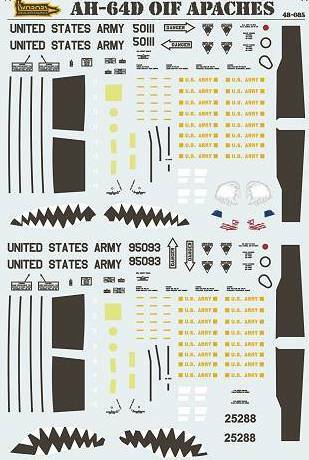 New from RAF Decals is their first sheet of helicopter decals. 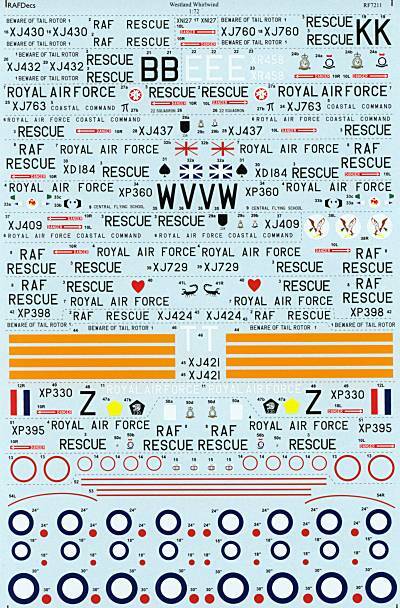 This magnificent (and very reasonably priced) set of professionally screen-printed decals for RAF Whirlwinds, #7211, covers a total of 16 separate aircraft. There are enough roundels, etc. to make a high proportion of them from the one sheet. The multi-colour items such as roundels and squadron badges are printed in two or three pieces to ensure perfect registration. 3. Dutch Decals have announced sheet #72064 which includes markings (without roundels, as usual, for which #72029 is required) for S-51 'Jezebel' of the Royal Netherlands Navy. As with the recent sheet #48041 (ex #48021) this appears to be a reprint of the decals for the same aircraft that were previously on #72025. 4. Available for several years, but not noted here before, Hawkeye Models Australia have a small decal sheet #CDS115 in both 1:72 and 1:48 for S-61N VH-BRI of Ansett Airways. This white aircraft features a rear fuselage decorated with the constellation Crux (Southern Cross) trailing rainbow coloured 'go fast' stripes on a dark blue sky. If anyone has any photos of this aircraft, please send them to the editor! Watch the Hawkeye website for a new 1:48 scale RAAF/ AAAC Huey upgrade set #CS-11 (tropical filter system) and a 1:48 RAN Gulf war Seahawk conversion. Los Angeles Fire and Police Bell 47G (x2). The LAPD aircraft is 47G-5 N4799R, now preserved in the California Science Center in Los Angeles, while the Fire Department aircraft is 47G-3 N73985. New York City Police Bell 412, N414PD, which is equipped with Doppler weather/ground mapping radar, SX-16 Nightsun spotlight, FLIR Ultra 6000 video system, pop-out floats, rescue hoist, and siren-PA speaker. Detailed historical and paint colour references are included for all aircraft. 7. Coming soon from Red Bolt (a.k.a. Anders Nowotny), is a sheet of decals #720133 for the Bell 204, Austrian Air Force, entitled "Ciao BELLa". This 2001 scheme marked the retirement of the AB.204B from Austrian service. Red Bolt decals are stocked by Flightdecs, who now also have Flying Colours Aerodecals from Sweden (notably the excellent #72-101, Vertol Hkp4), and most of the re-issued Scale Nutz range from Singapore. 8. Twobobs Aviation Graphics sent the artwork for #48-085 AH-64D 'Operation Iraqi Freedom Apaches' to their printers last week, with delivery expected in mid October. This sheet will feature three aircraft, two with shark mouths and one with eagle tail-art, and will have enough decals on it to build two of them. 9. Czech Master Resins have added an alternative undercarriage to their Sikorsky R-6A Hoverfly II (HKN #187), for use when the helicopter is loaded and the assembly is compressed. The geometry of the original part has also been changed slightly, but this is a modification you can very easily make yourself, and it's hardly worth worrying about. CMR will supply the alternative assembly as standard in their second production run, which is about to get under way. If you already have the kit and wish to obtain this part, you can contact CMR directly, but please don't expect to get it for nothing, production and shipping expenses must of course be covered. 10. Eduard's September releases #XF-224, a set of canopy and wheel paint masks for the 1:48 Academy CH-46E Sea Knight. There's also a book on the H-46 family due out in October from Landing Zone. 11. 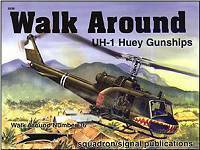 Wayne Mutza's latest book for Squadron/Signal, UH-1 Huey Gunships Walk-Around, is now published. 97 color photos, 100 monochrome photos, 12 colour profiles, 2 3-view drawings, 3 scrap illustrations, and 2 tables, #5536. Wayne's encyclopedic knowledge of the Huey family shows throughout. Along with coverage of all US gunship variants based on the airframe, there's good detail coverage of the basic aircraft itself. As well as US Army short-fuselage Hueys, you will also find Navy Seawolves, Marine UH-1E's, long-fuselage US Army birds, and a section on the UH-1N. There is a brief book review by Scott Van Aken at Modeling Madness. 12. Latest publication from Wings and Wheels is Present Aircraft Line No. 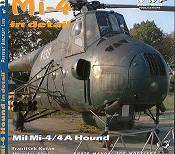 11, Mi-4 Hound in Detail, by Frantisek Koran and Miroslav Khol. This indispensible accompliment to the 1:35 Trumpeter kit (if you haven't already built it, and it's now available at knock-down prices) has 72 pages of colour photos featuring two Czech aircraft in exhaustive detail; 0538 preserved at the Prague-Kbely Aviation Museum, and 4139 preserved at the Aviation Historical Society Foundation at Vyskov, as well as an assortment of other airframes. 13. The N2 2004 edition of the magazine Mir Aviatsii is dedicated to the history and current service of the 830th Independent Helicopter Regiment, a ship-based anti-submarine unit attached to the Russian Northern Fleet. There are four separate articles covering 56 pages, many photos in both colour and monochrome, plus 22 colour profile drawings. All the aircraft that have been used by the regiment are covered - Mi-4, Mi-6, Mi-8, Mi-14, Ka-15, Ka-25, Ka-27, and Ka-29. 14. There's another review of the recently issued Fonderie Miniature 1:48 H-21, this time at Hyperscale (20-Sep-04). And yet another at Internet Modeler, in their September 2004 edition. And Modeling Madness have reviewed the Zvezda Ka-27PS Helix, #7247. 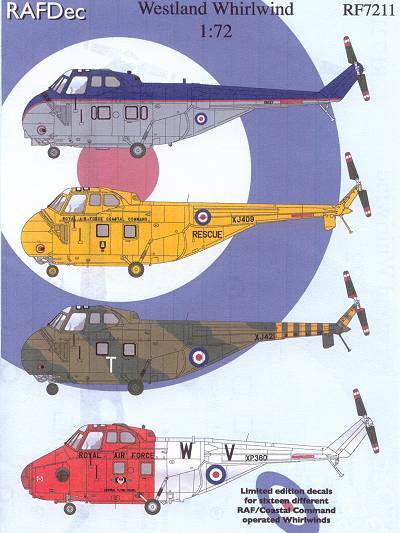 While ARC (6-Sep-04) have had a look at the recent 1:72 IAF Helicopters decal sheet from Sky's Decals (HKN #186). Thanks to Len Lundh, Tony Morgan, Pete Brown, Yevgeny Borissov, Guy Holroyd (Linden Hill), Drew Graham, Petr Buchar (CMR), Steve Evans (Hawkeye), and Mario Prast.